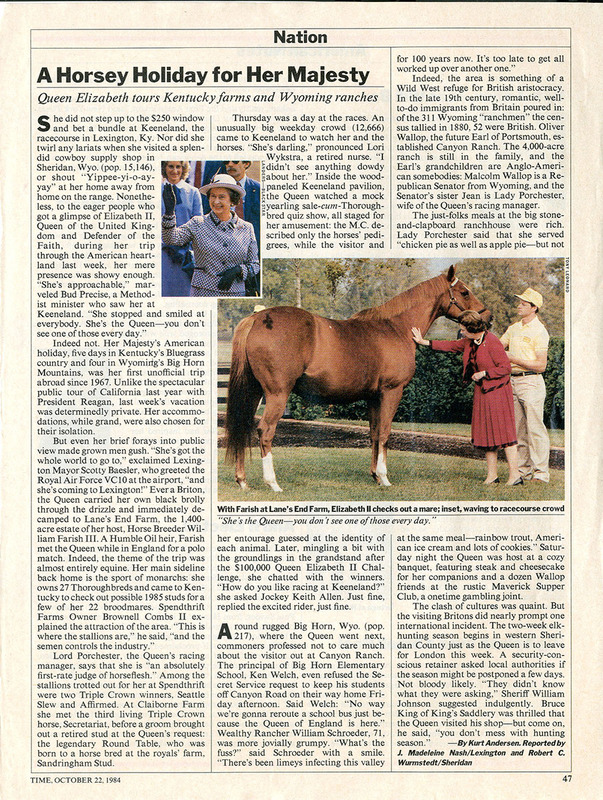 A Keenland race program for the day that Queen Elizabeth II attended the races, Oct. 11 1984. Program has insert noting the day's running of the Queen Elisabeth Challenge Cup and fact that her horse, Dunfermline won the 1977 Epsom Oaks Stakes and Doncaster St. Leger. Back of insert gives a brief history of the royal family's involvement in horse racing, which began with King Charles II. The Time Magazine article describes her "unofficial"/private U.S. visit of five days in the KY Bluegrass and in Wyoming's Big Horn Mountains. “Queen Elizabeth II's Visit to Keenland,” Digital Collections, accessed April 23, 2019, https://digitalcollections.eku.edu/items/show/27461.